I had noted in a comment box (appended to this post) that it would take a real imbecile to think that Dura Europos was typical of the early church. But many folks who bow down to paintings and statues don't sweat that history stuff, and consequently end up appealing to a most unique place like Dura Europa where (evidently) even the Jewish synagogue was highly decorated (although in a style borrowed from the Roman pagans). Of course, some of the same people will try to claim that Dura Europos represented a typical Jewish synagogue of the time as well. But we may leave such issues momentarily aside. One such person (Mr. Bellisario) has tried to counter (between two insults) with the following: "How many other examples do we have of early house churches?" Such a comment misses the issues in a spectacularly simplistic way. The issue is not how many examples we have of early house churches, but why anyone would think this "example" is a typical example. For example, we know almost nothing about the "Christians" that lived at Dura Europos at the time. For example, we don't know whether they were heretics or orthodox, whether they were strict or syncretic in their views. We don't have any particularly good reason to think that they were orthodox Christians. We have apparently found some Aramaic texts at the location that appear to be Eucharistic prayers similar to those in the Didache, and (at another location in the garrison town) a tiny fragment of a Greek harmony of the gospels (though not Diatessaron of Tatian). In other words, we have no strong reason for linking this building to any particular branch of "Christianity." But, of course, to answer Bellisario's simplistic question, how on earth would anyone hope to recognize an early house church that wasn't decorated? If it were not for the murals, we wouldn't be inclined to call the building they found at Dura Europos a church. We have no way of knowing how many of the myriad undecorated houses we've uncovered were house-churches. So, of course, it is a silly question. But what about the decorations at this building in Dura Europos? They were not icons, they were not statues, they were "murals," rough sketches marked on the wall. From the images I've seen of them, we have to speculate as to how they are intended to relate to the Bible, but there are three main murals, and a couple more that are shown in a fourth image. 1. "Good Shepherd" - The mural shows a shepherd carrying a sheep. Such a depiction is somewhat similar to a "Christ the Good Shepherd" icon but in other ways is more similar to this earlier depiction of a shepherd (link) alleged to be from about the same time period - 3rd century - from Roman catacombs. 2. 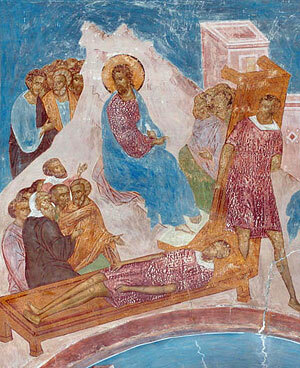 "Healing of the Paralytic" - The mural shows a man taking his bed on his back, apparently after being cured, which is reminiscent of the healing recorded in John 5. Such a depiction is somewhat similar to a rather modern-looking icon I found (link) but more similar to a fresco/icon from the Dionisian Frescos (1502). 3. "Peter and Jesus Walking on Water - The title is self-explanatory. The closest icon I could find was this one (link). As you can see, while there is some resemblance between the icons and the murals, it's not a real close match. Basically, if you let them be considered matches, then you are basically calling any drawing an icon. Of course, there were items more like icons at Dura Europos (link), but keep in mind that these are from the local temple of Mithras. There are plenty of other good reasons (such as the Council of Elvira - about 60 years after the date of the building at Dura Europos, and the writings of Epiphanius of Salamis and Eusebius of Caesarea - leading to sharper battles in the 8th-9th centuries) to think that paintings were starting to enter into Christian churches, but were meeting resistance. As well, as I've previously mentioned, much of the writings opposed to novel introduction of icons into worship was destroyed (and/or disparaged) by the icondules. 1. Certainty about information being true is properly justified according to the source of that information. 2. God is the ultimate and only infallible source of information. 3. Therefore, certainty in the strictest sense is only possible via revelation from God. 4. Perspicuity is important to certainty. 5. Scripture is the highest form of revelation, because it is the most perspicuous. 6. Scripture is not God's only revelation to men, for Scripture itself testifies clearly to general revelation. 7. General revelation may not teach much clearly, but it does clearly teach the existence of God, time, space, general morality, and logic (inter alia). 8. General revelation is manifest in one way by the imprint on the human heart of the knowledge of the existence of God, [one's own existence - the existence of other minds], time, space, general morality, and logic (inter alia). 8. If Scripture teaches a proposition, that proposition is necessarily true. 9. No other teacher besides Scripture (at the present time) both provides propositions and shares this quality of infallibity. 10. Therefore, nothing can be known with absolute certainty aside from what is taught in Scripture [or General Revelation] or what is properly deduced from Scripture [and/or General Revelation]. 11. Men, however, are capable of using imperfect knowledge. 12. Some knowledge is more imperfect than other knowledge. Hopefully this list of 12 items spells out a framework of epistemology that is understandable, even if not everyone agrees. Response to Mr. William Albrecht regarding Cajetan and the Canon. Cajetan was a Roman Catholic cardinal who opposed Luther as an official representative of Rome, but who also held to the same canon as "Protestants" do today. This clip discusses that issue as well as a few related issues. What does Simon mean? and did "Peter" replace "Simon"? I recently heard a terrible argument arguing that Simon means "grain of sand" and that when Jesus changed Simon's name to Peter, he was changing this grain of sand into a Rock. Obviously, as you might guess, this argument came from someone who thinks that Peter was the first pope. There are two significant problems with this argument. In these verses we see that Simon is referred to frequently as "Simon Peter" or by similar labels, such as "Simon, whom he also named Peter" (where "also" implies that this was an additional name) and "Simon he surnamed Peter" (where "surnamed" implies that an additional name was imposed upon Simon). Finally, while we see a large number of verses (not reproduced above) where Simon is simply referred to as "Peter," we never see Simon referred to as "Peter bar-Jona" or "Peter the son of Jona" or the like. Thus, Simon's name wasn't changed: he was given an additional name that essentially took the place of his natural name. Genesis 29:33 And she conceived again, and bare a son; and said, Because the LORD hath heard that I was hated, he hath therefore given me this son also: and she called his name Simeon. There is an odd artifact I've noticed in discussions between followers of Van Til and those of Clark. For some reason, those in the camp of Van Til take great delight in pointing out that Clark used the term "know" to refer to what we would call "know with absolute certainty." As such, Clark did not "know" that the woman with whom he was living was his wife. Endless merriment such comments make, particularly when the quotation marks around "know" are removed! But why? Is it just to goad on the followers of Clark? Is it simply for the pleasure of hearing the sound of "you don't know that I am even real" or is there a deeper reason? Surely the reason cannot be that the followers of Van Til think that Clark was wrong, and that Clark could know with absolute certainty that the woman he was living with was his wife. After all, it's imaginable that his parents-in-law had identical twins, one of whom was given up at birth. By chance, this twin sister discovered her long separated twin, murdered her in a jealous rage, and took her place. We could think of even more implausible options, but this relatively simple account provides one way that a person might be mistaken about such an important issue. Is it probable? No, it's not (though, of course, Clark was justifiably uncomfortable with such a concept), but the issue is certainty, not probability. In the end, Clark is right in saying that the only things we can know with absolute certainty are those things that are revealed to us by God (whether through general or through special revelation). The only way to be absolutely sure about something is to obtain that knowledge from an absolutely reliable source. The Editor-in-chief of the Vatican newspaper, L’Osservatore Romano has claimed that President Barack Husein Obama "is not a pro-abortion president." (link) If this is where Benedict XVI is getting his information about the American president (and I'm sure folks will assure me that the pope has other sources than the Vatican newspaper), then it would explain why he did nothing as a nominally Roman Catholic school called "Notre Dame" honored the most pro-abortion president that America has ever had. One really has to read the entire article for oneself (and, as one of my pseudonymous readers likes to point out, just because it is in a news article doesn't mean its true). The article is from the "Catholic News Agency." A few of the folks who read my blog have taken umbrage with my recent comments (link) regarding Patrick Madrid's apologetics forum, ironically titled "Speak Your Mind." Two of those I've already addressed in part in a previous post (link) and another has posted comments on his own blog as well (a post creatively titled "Ummm - What?"). I certainly agree that Mr. Madrid's turtling is not complete. He has not withdrawn himself wholly from the apologetics ring yet, he's just cut off a significant aspect of what used to be his apologetics sphere. A second complaint is that there is no way to know Madrid's heart, and consequently we cannot infer any intent to conceal his website even from the fact that he has now concealed his formerly public website. As far as I'm concerned such a complaint is frivolous. We reasonably infer that people intend to do what they do. Perhaps someone will further complain that the issue is not over whether Mr. Madrid intended to hide his candle under a bushel basket in this instance, but over why. In other words, was it to hide from criticism or not? I acknowledge that this inference is not as clear as the first inference. However, considering that his lock-down of public access to his website follows hard on the heels of his complaints that comments from the website were being posted elsewhere, it is a reasonable inference. A third complaint is that since Madrid has debated Michael Horton and Robert Godfrey (apparently referring to a single debate entitled: "What Divides Us?" in which Madrid, Sungenis, and Marshner took the Romanist side and Horton, Godfrey, and Rosenbladt took the Reformation side), it is unreasonable to suppose that Madrid would be loathe to interact with my friend who uses the nick "Algo" and his critiques. Presumably, the hidden premise is that because my friend Algo isn't (as far as the complainers know) a Westminster Seminary professor, his critiques will necessarily be easier to defeat than those of said professors. Therefore, our critics seem to suppose that it is unreasonable to think that Madrid has significant limited access to limit criticism. I understand the basic intuition of this objection, and to a small extent I can agree: if Madrid is brave enough to handle Godfrey he should be brave enough to handle my friend Algo. The primary way that Algo relates to our discussion is that he was about the only (if not the only) Reformed voice that had not already been kicked off by the moderators of the site - and he was kicked off when two Reformed blogs posted discussion of his interactions there. In other words, he was essentially given the boot for leaking information. In any event, I hope the above has helped to clarify matters. If someone has inaccurately inferred from my previous post that I think (or that I want you to think) that Mr. Madrid has entirely withdrawn from apologetics, this post should disabuse them of that erroneous inference. In this clip, we respond to Mr. William Albrecht's continued (but unsupported) insistence that apparently terms like "the bread becomes the body of Christ" or "the bread is the body of Christ" must be understood neither literally (as actual flesh with skin, veins, DNA, etc.) nor analogically but transubstantially. We note that Mr. Albrecht doesn't like the comparison between Latin and modern English, and so we provide commentary from Augustine himself on the use of metaphor in Scripture. There has been much hubub about a supposed missing link that has been allegedly located in the form of what appears simply to be a lemur monkey skeleton. Less attention has been given to a serious problem for evolutionists: a newly discovered species of mega-shrew (link). Why is this mega-shrew a problem? It has a characteristic found in snakes, but not in any allegedly common ancestors of both shrews and snakes: teeth capable of injecting venom. What is so significant about that? It requires that naturalists hypothesize parallel evolution: two species coming to be by chance to have similar features through the process of random mutation and natural selection. The chances of both a shrew and a snake developing a similar beneficial mutation by chance is extremely small. Although this cannot definitively disprove naturalism (nothing can - naturalism is by definition unfalsifiable), it does require a still higher degree of "faith" (if you will) by the proponents of naturalism. This is, of course, not the first such instance. One of the most notorious examples is the eye of the squid as compared to the eyes of men. Again, no alleged common ancestor can be found to provide appropriate nesting for this common feature and consequently the hypothesis of parallel evolution must be invoked. 1. Hypothesize that everything is the result of natural selection and random (sometimes beneficial) mutations. 2. Attempt to arrange species data using nesting to meet hypothesis. 3. If nesting cannot fit all the species data, allege parallel evolution of species. 4. Claim victory despite the vast statistical improbability of beneficial mutations happening in different species in parallel. 5. If necessary, sprinkle in the pixie dust of vast periods of time to explain away the inconceivably unlikely event you are alleging occurred. 6. Insist that any explanation that invokes the supernatural is just filling gaps, superstitious, or religion interfering with science. To a certain extent I'm treading on Mr. James Swan's toes in posting this episode to the "We Have Apostolic Tradition" series. Mr. Swan had noticed that Roman Catholic apologists often let us know how crucial it is to have an infallible magisterium and church Tradition in order to interpret the Bible correctly. With so many Roman Catholic apologists now commenting on sacred scripture, Mr. Swan thought it would be interesting to provide their commentary on the Bible. Let's see how they've been able to rightly divide the word of truth. One issue that comes up again and again is the issue of justification by faith alone. As most people know, this was an issue of great importance to Luther and is viewed as one of the dividing lines of the Reformation. Accordingly, many Roman Catholics have been quick to accuse Luther of adding the word "alone" to his translation of Romans. In Rom. iii. 20, and Rom. v. 15, Luther inserted the word "only", and in Rom. iii. 28, after the words "we account a man to be justified by faith," he added the word alone, "by faith alone." When charged with having falsified verse Rom. iii. 28, by adding the word "alone," he replied, "Should your Pope give himself any useless annoyance about the word sola (alone), you may promptly reply: 'It is the will of Dr Martin Luther that it should be so.'" Mr. Swan has already pointed out (at the link above) that Joseph Fitzmyer has confirmed that Luther's translation here was not a radical departure or unwarranted insertion. Indeed, as Mr. Swan pointed out, Fitzmeyer references the fact that Bellarmine had identified at least eight men who had translated Romans 3:28 to include the word "alone" ranging from Origen to Thomas Aquinas. But, of course, Fitzmeyer has been tagged as a "liberal" within Catholicism, and consequently he sometimes gets dismissed as not being sufficiently scholarly or not being truly unbiased. However, it should be noted that Fitzmeyer is not all on his own here. You'd almost think that the Vatican has conceded that Luther was not just right about his translation, but that he was right about his doctrine. That thought would be wrong. Through careful sophistry the Vatican today has done what the Vatican in Luther's day was unable to do: they have found a way to affirm Luther's words while meaning precisely the opposite thing. "Grace Alone" is not, in the Vatican's new double-speak, inconsistent with human cooperation. "Faith Alone" is not, in the Vatican's new double-speak, inconsistent with justification by human cooperation (recall Trent: "CANON IX.-If any one saith, that by faith alone the impious is justified; in such wise as to mean, that nothing else is required to co-operate in order to the obtaining the grace of Justification, and that it is not in any way necessary, that he be prepared and disposed by the movement of his own will; let him be anathema." and "CANON XIV.-If any one saith, that man is truly absolved from his sins and justified, because that he assuredly believed himself absolved and justified; or, that no one is truly justified but he who believes himself justified; and that, by this faith alone, absolution and justification are effected; let him be anathema." and "CANON XXVII.-If any one saith, that there is no mortal sin but that of infidelity [unbelief]; or, that grace once received is not lost by any other sin, however grievous and enormous, save by that of infidelity [unbelief]; let him be anathema." and again "CANON XI.-If any one saith, that men are justified, either by the sole imputation of the justice of Christ, or by the sole remission of sins, to the exclusion of the grace and the charity which is poured forth in their hearts by the Holy Ghost, and is inherent in them; or even that the grace, whereby we are justified, is only the favour of God; let him be anathema.") To which we might add many more such quotations. What is the bottom line? Rome has been forced to acknowledge that Luther's translation was correct. Instead of going after the translation itself, there has been attempt to redefine the phrases "sola fide" (faith alone) and "sola gratia" (grace alone) to include a concept that can be adopted by those who believe that they contribute something of their own to their justification by co-operation. Who has apostolic tradition? The answer, as always, is whoever sides with Scripture. Responding to my recent post on Patrick Madrid's turtling of his apologetics forum (head and legs well in shell), one Roman Catholic seems to have missed the point. Nick writes: "I agree with you, if censorship (via difficult registration) is what is going on, then that's wrong and Catholics should not be engaging in that." No, that's not what I said. There were (presumably still are) censorship issues at that forum. For example, people were not permitted to link to Dr. White or my blogs, and the administrators routinely edited folks' posts (on both sides of the Tiber). That's not the issue. The issue is that Patrick Madrid is trying to hide his apologetics (at that forum) from the public eye: put his flickering candle under a bushel basket, as it were. Nick continued: "That said, I don't like such censorship on any apologetics blogs, and only after grave violations should someone be banned." I don't think I'll ever "get" why folks think that other people's blogs are supposed to be a "free speech zone" for them. While I do permit most folks and most comments here, there's no particular reason I need to permit any comments at all. It's my blog. If you want to respond and you want your comments to be seen by all (as opposed to just being seen by the person whose blog it is), get your own blog - they're free and easy to set up. I'll even help you set yours up, if you cannot figure out how to do it. Nick continued: "I think that to be fair with your critique and not be searching for someone with a speck in their eye, you should not moderate comments on your own blog. I've spent time and energy writing responses to some of your posts, only to find they never see daylight. That's unfair to me and I believe goes directly against the spirit of apologetics." If you read the link that I've directed all commenters to on the comment submission page, you would be well aware that your comments may end up in a black hole for a variety of reasons. Other times, comments are simply sitting in moderation awaiting my finding time to respond to them. In early January, there were about 150 such comments - and that number has slightly climbed through the first half of the year, even while many comments have been approved and responded to. There is a mechanism that permits you to comment on the blog post without my getting involved in moderation. That is by commenting on your own blog and providing a link. The blogging software should (and normally does) automatically create a link that directs the readers to your "comments elsewhere" at the appropriate section. Believe me, I can appreciate that Patrick Madrid does not want to let people speak their mind on his forum - although one might find the name "Speak Your Mind" as the forum title a bit duplicitous. But, of course, aside from the irony of the name of his forum, I wasn't criticizing him for censoring other people, but for hiding his apologetics. Besides that, of course, I do host a blog specifically for providing a forum for opposing viewpoints to interact with me (link to debate blog). It's unnecessary for me to do so, but it does prevent folks from suggesting that I'm trying to hide my positions from criticism. Nick continued: "To me, censorship on blogs or forums (and I know of a few Reformed apologetics forms who restrict membership) is a bad sign as far as openness to opposing views go." Plenty of fora restrict membership. That's quite understandable. Surely no one expects that my local parish of Roman Catholicism will permit me to get up and share my views after the priest gives his homily. I don't have the least problem with blogs (and other sites) that don't advertise themselves as being a free speech forum. What I do find silly is apologetics that tries to hide itself from its critics. What we do (in Reformed apologetics) is open for the world to see. We don't try to hide our arguments from the outside world. We're not afraid of seeing our arguments addressed in the popular media of the opposing side. Again, don't get me wrong. There are fora that can and should be private. I'm not expecting that the next college of cardinals that elects Benedict XVI's successor needs to let me in to review its on-going discussions, nor that Internet fora cannot be entirely private or contain private sections. Not at all. I'm simply suggesting that secret apologetics (i.e. trying to keep the arguments secret) suggests weakness of argument and an attempt to hide from criticism. Update: Nick's not alone in confusing the issue. A guy who uses the nick Syzygus makes similar comments on his own blog (link). Interestingly, while Syzygus mistakenly claims I require folks to register to post comments (I do not, though perhaps I should), he also (more accurately) complains that I am pseudonymous and do not post my credentials, while he himself doesn't post his name or his credentials in any particularly visible place on his blog (perhaps one could find them if one dug more deeply there). What Mr. Burgess misses is that I don't hide the arguments I use. They are out there in the open for all to see. In this eighth section of my reflections on my recent debate with Mr. William Albrecht on the veneration of Mary, I respond to a video that Mr. Albrecht put out (link to Albrecht's video). Since he put out a video, I've also provided this response in video form. Mr. Albrecht's support for this contention was that I allegedly simply don't realize that the word κεχαριτωμένη (kecharitomeneh) is used as a title for Mary. He supports his position that this is a title by saying that this isn't him reading into the text, this is just a basic fact that "anyone familiar with even the basic level of New Testament Greek - Biblical Greek - would know this fact." He continued: "In fact, I don't know a single Protestant that would deny this." I have to chuckle a bit. Ironically, before seeing this video, I had already gone on in a previous post into much greater detail about what the best possible arguments are for the word being a title, and disposed of them (link to previous post). Mr. Albrecht offers us absolutely nothing except his own assertion as a basis for accepting his position. If it were such a "basic fact" as he claims, you'd think that he'd be able to find at least one person who agreed with him, but instead he resorts to a negative assertion: he claims he doesn't know of any Protestant who would deny this. The next step, no doubt, is for him to ask me to find some scholar who rejects his unusual view - rather than him having to prove his own point. Is this really the best that he can do even without the pressures of the debate? Amazing. 2) "He's [TurretinFan is] also Confused about Ephesians 1:6"
Mr. Albrecht's support for his contention that I am confused is that Ephesians 1:6 doesn't use the same exact word. Again, this was rather amusing. It is the exact same verb, just a different conjugations of the verb in each case. Mr. Albrecht reads off the two different conjugations, seemingly intending to give the listener the impression that these are two different Greek words, rather than two different conjugations of the same Greek word. What's even more amusing is that, during the debate, Mr. Albrecht had acknowledged that it is the same word in Ephesians 1:6. There is an important difference between the two conjugations as it pertains to the word being used as a title, as I have already explained in my previous post. Unfortunately, if you watch the video, you'll see that Mr. Albrecht gives you no argument in this regard, just assertions. In fact, he puts it well when he says "The fact - not even an argument - is that kecharitomeneh is used as a name for Mary. And that's not even an argument, that's just something he was confused about." Well, yes, Mr. Albrecht tries very hard to present it as though it were a fact, Mr. Albrecht does try to persuade people that I was confused, and Mr. Albrecht does so without making an actual argument, just a string of assertions.